What a fabulous game! Essentially a “recycle” of the popular PC title 4D Boxing, Electronic Arts once again redefines a video game sport with Foes of Ali. 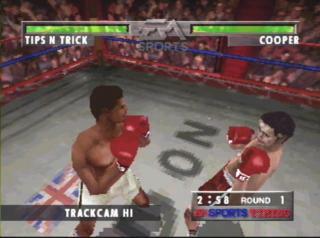 In this contest, you control one of ten boxers (Ali, Frazier, Norton, Chuvallo, Cooper, Wepner, Spinks, Ellis, Foster, and Liston) in an exhibition match, tournament, or “career” mode. Exhibitions are one-match games where you can choose the competitors and the arena. Tournaments consist of round robin matches with up to eight boxers in the pool. The career mode is limited to Ali vs. the competition. Notably absent from the list of Ali’s “foes” are George Foreman and Larry Holmes, both of whom had classic confrontations with the greatest. The options don’t stop there, though, my fine friends. For exhibitions and tournaments you also have a wide variety of rules to select from. Do you want a physician to be able to stop the fight if the bleeding gets too profuse? Should a knocked down fighter be saved by the bell? How many rounds should the contest be? Just about everything from the scoring method to the amount of blood that will go spurting across the ring are adjustable. I really like adjustable. Had I not seen such incredible displays of graphic power on the newer Saturn and Playstation recently, I would not have believed such graphics were possible on a 32-bit platform. They’re very impressive, especially if you’re a die-hard 3DO owner with no intention to buy another system. The action appears a little jerky (got that, fruitcake?) on some of the camera angles, but not only will you find angles that reduce this, but you’ll get used to the motion in no time at all after playing the game a short while. On the subject of camera angles, there are 21 “selectable” ones, most of which work fine for one-player contests. There is a custom camera viewpoint for those looking for that perfect spot. Custom view allows 360 degree control as well as all areas above the boxer’s midsection - even overhead - to position to. One or two of the pre-set angles are really silly, like the blimp view, which reduces the fighters to ants and the referee view, which jerks around so much your eyes will do silly little backflips. Otherwise, the variety is very nice indeed. The fighters represent the real life counterparts both graphically and strategically. Their digitized bodies are pasted to the polygons pretty effectively. If you look at a fighter straight on, you can easily tell who it is, although from the side it can get a little tricky. It seems the fighters all have the same physique, which is really incorrect when comparing two fighters like Norton to Wepner. Still, it works - and each boxer’s stance and style make each one decidedly different. 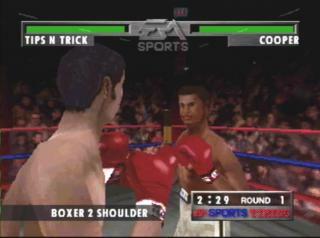 I have never played a boxing sim that didn’t take some time to master the controls, and Foes of Ali is no exception here. The learning curve is pretty short, though, thanks to the intuitive interface of the game. Button A throws a left, Button B throws a right, and Button C is your “bob and weave”. The Left and Right shift buttons block with the respective glove. The type of punch you throw is controlled by how you use the directional. We’ve all seen this technique before, but usually at the expense of footwork... for how am I to punch when the directional also makes me dance? Somehow, EA Sports figured it out, though. There is never a moment when you feel like you’re out of control. Yes, there is a lot to like about this game, but what keeps it from being perfect is what seems to be missing. The historical mode really offers nothing but a very brief verbal summary of the actual bout. Where’s the footage? Even a series of photos to correspond with the audio would have been nice. I would have liked the “create a boxer” option, too. You really can’t get tired of the ten in the game, but you can only play career as Ali, leaving me yearning what it would be like if a brawler tried his hand against these guys. Or a bleeder. Unless there’s some sort of code (which EA is very popular for), I guess I’ll never know. I have other little nits, too, but nothing that really takes away from the game. I just want more of it! 3DO owners have been through some serious droughts over the past two years, and it always takes a game like this to get developers thinking again. I wouldn’t have thought this game possible on this system, but it is a pleasant surprise and one that I can wholeheartedly recommend to every 3DO owner. CODE: pause game. Hold LS/RS, press C. TEAM and PREBEG are pictures.